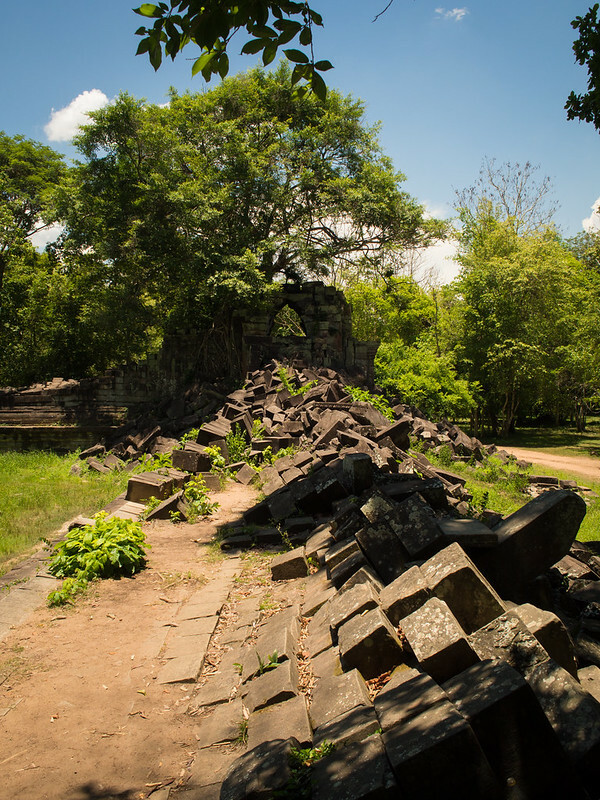 The ruins of Beng Mealea (Beng Melea, Bung Mealea), 75km from Siem Reap, was the first temple ruins we saw on our Siem Reap trip. 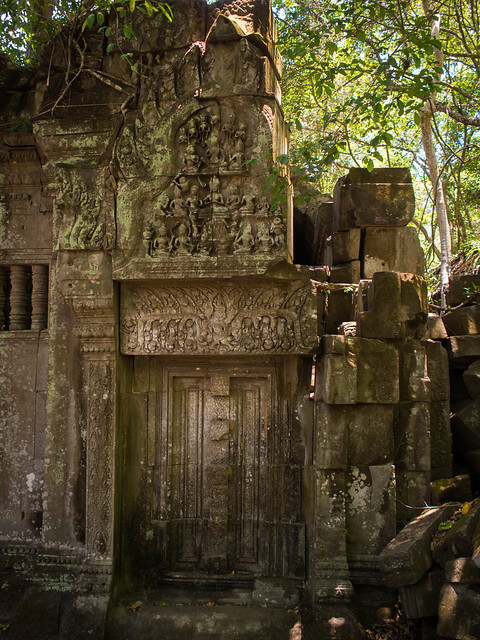 There is not much known about the temple, which remains largely unrestored, but its architecture suggests that it was built at around the same time as Angkor Wat, and that the nearby sandstone quarries helped build not only Beng Melea but also for other temple complexes. 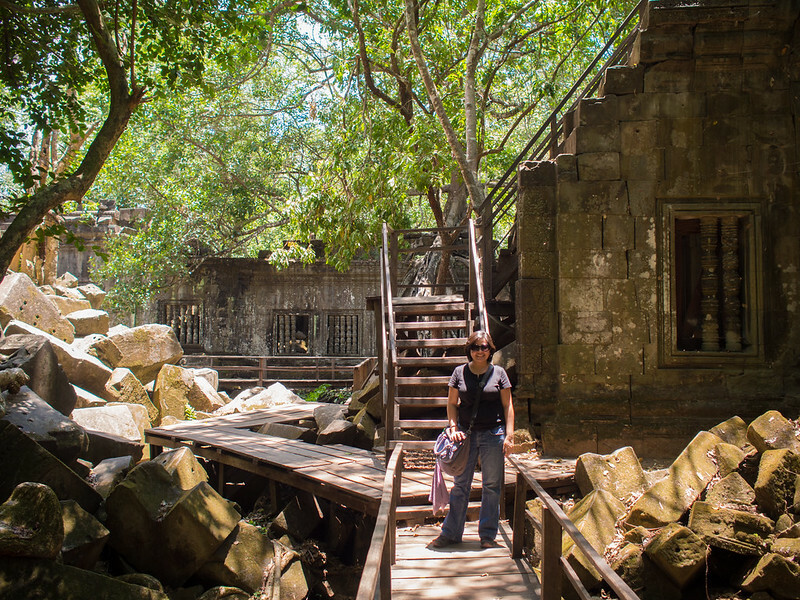 There was virtually no one else in the ruins as we explored. Outside past the temple moat, a family was celebrating a wedding and we could hear the local songs blaring from their speakers, scratchy and insistent, almost right up to the main galleries. 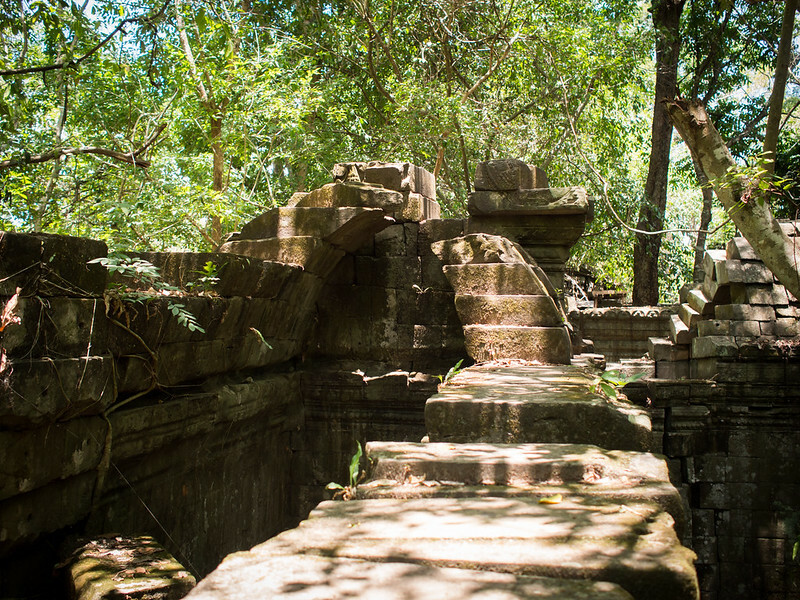 About half of Beng Melea has wooden steps built to aid tourists, though these have generally narrow steps and made it a bit challenging to walk down on. 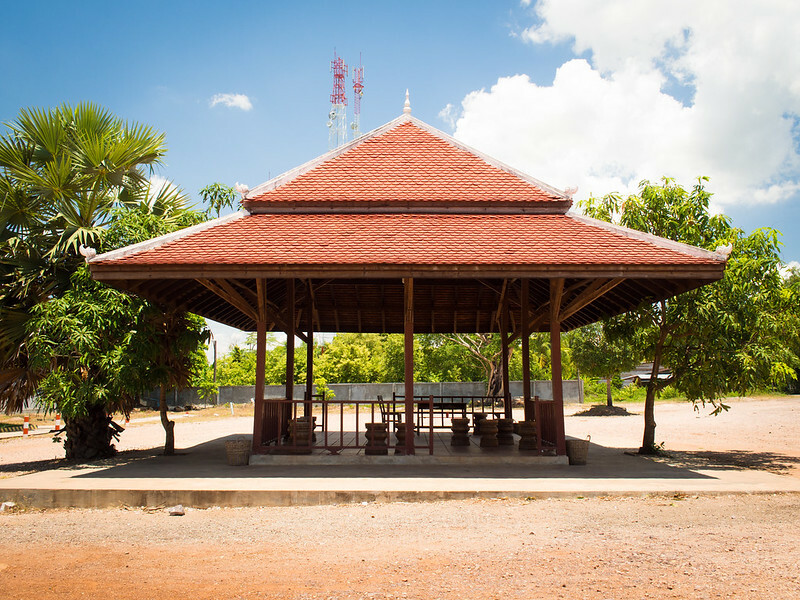 Much of the temple is in the shade. Kids scrambled on the rocks outside the wooden paths and walkways, peered at us and ran away, slippered feet sure on the rocks underfoot. 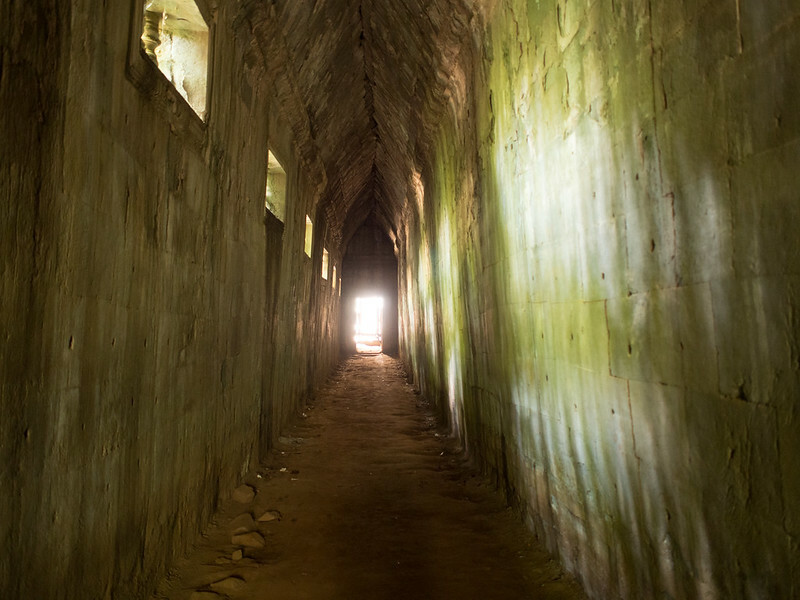 The last half of Beng Melea is more rugged, where the wooden paths lead down and disappeared into a dark corridor, cool and shadowed, hidden secrets hiding from the harsh sun outside. We climbed up out at the other side, through a tumble of rocks, all hard slabs and corners. 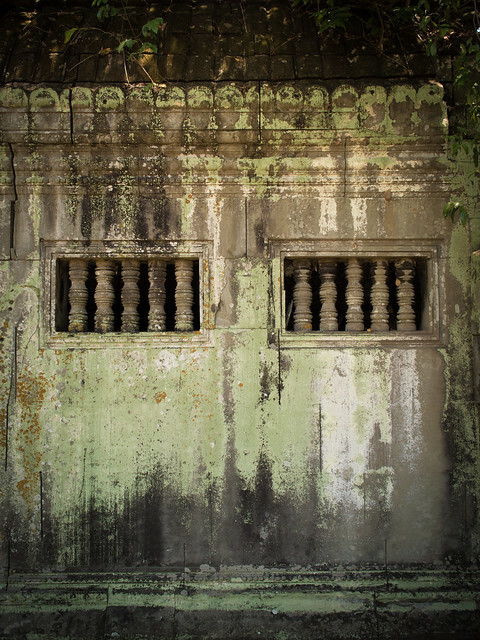 Beng Mealea was quiet and peaceful that Saturday noon. 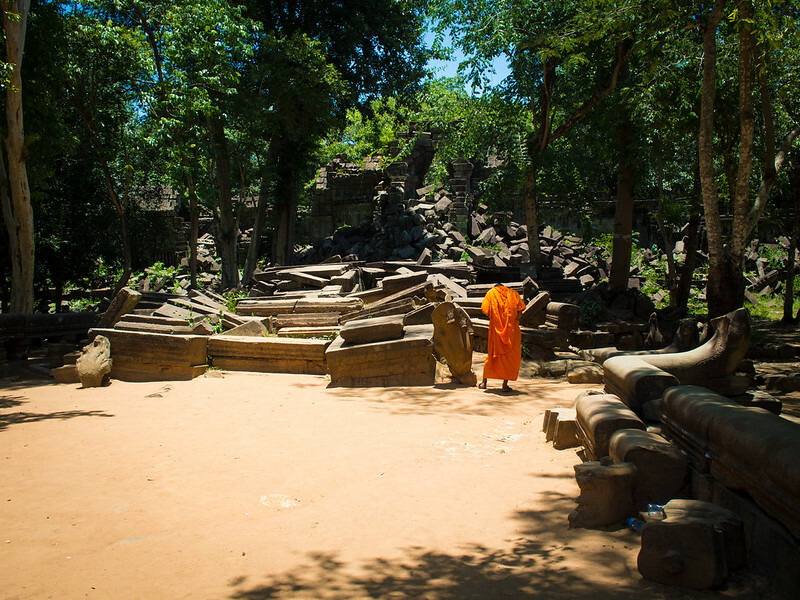 It felt magical to me, this temple shadowed by the trees. 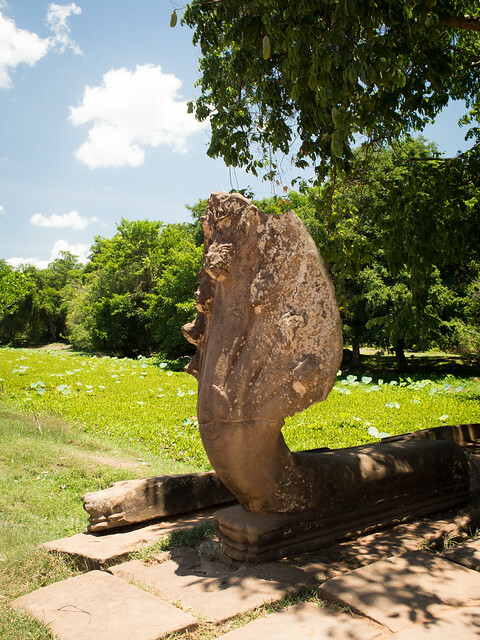 We went around the grounds as we went back, climbing over rocks and passing through huge silk-cotton trees determined to have their way with the temple. Getting there: We hired a driver and guide for the two days we spent “ruins hopping”. 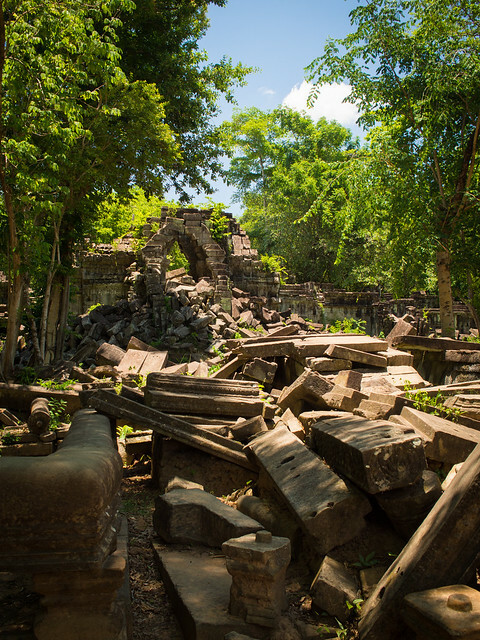 As Beng Mealea is over an hour from Siem Reap by car, to maximize time you should hire a driver/taxi to get here–but you can go via tuktuk by all means. 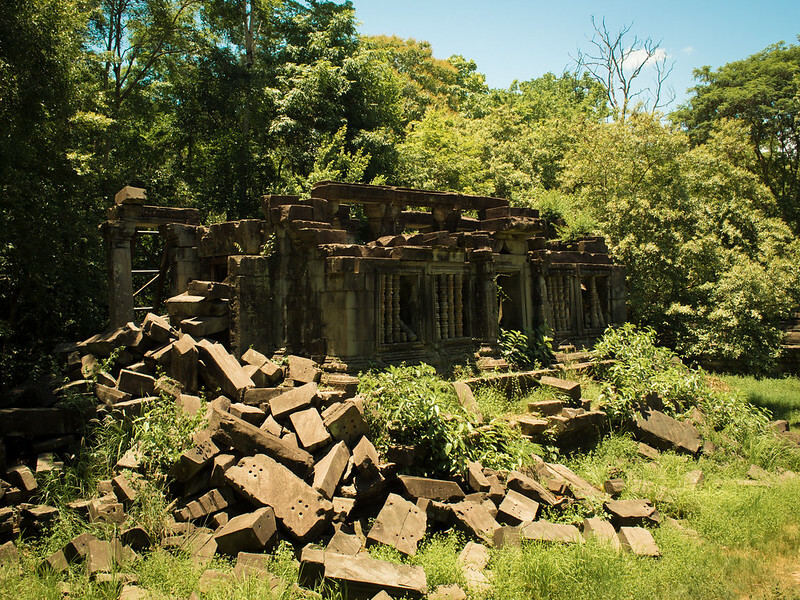 Our guide, however, wouldn’t recommend this transportation, as some roads to Beng Mealea aren’t paved and he expressed safety concerns about that route. 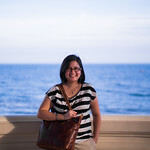 Check your hotel/hostel for help hiring out a car and/or guide for the day. 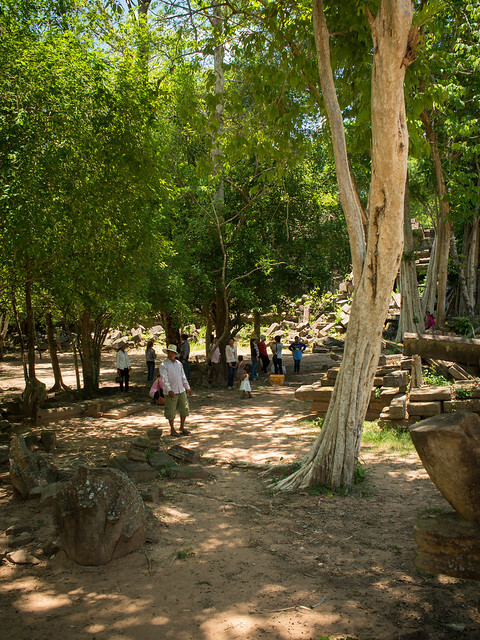 Getting around: The toll station/stopover area where you will get tickets to Beng Mealea has toilets if you need a bathroom break, but not much else; there are also nearby eateries once you have left Beng Mealea, but note that there are big bus tours who ply this route. (We had to change lunch plans due to this.) 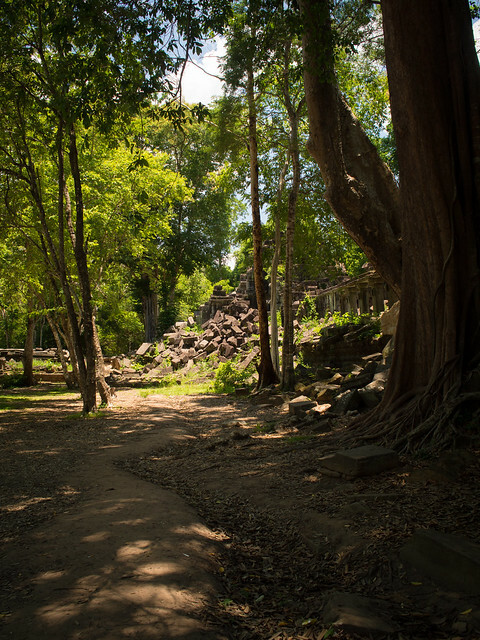 Depending on how keen you are with exploring the ruins, you can opt to stay in the designated paths and wear flipflops, or do some mild climbing with sturdy shoes (you probably should not attempt high mountains of rocks though). In the dry season it does get very hot, even with the trees overhead. Definitely worth going to, put this into your itinerary! 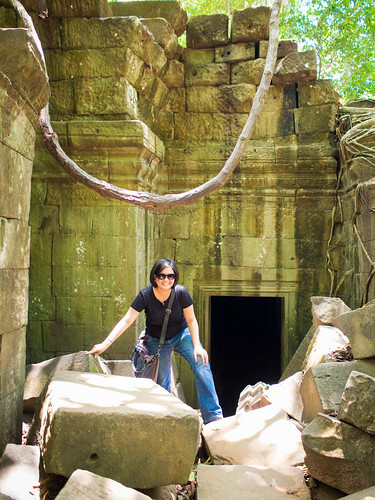 This Places, Seasonal wanderer, Travelogues post was published on Saturday May 24, 2014, and tagged under beng mealea, beng melea, cambodia, siem reap.